You may love your pet, but chances are they have some behaviors that you’re not as crazy about. If so, here’s a few basic training strategies to help you both feel the love. Got a problem barker? It’s a common issue, but you’ve got to be consistent and patient if you want to make it stop. First, yelling back at your dog just makes him think you’re joining in on the fun. Instead, calmly say “Quiet!” and reward your pet when he stops barking. It might take him a while to get it, but eventually most dogs do. Does your dog walk you? 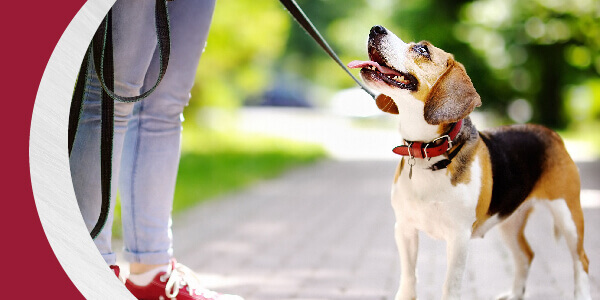 Leash-pulling not only ruins walks, but it can be dangerous for both you and your pooch. Start by playing “follow me” with your dog: While holding the leash, take a few steps backward and when the dog turns and follows you, say “yes!” and immediately reward her. You might also consider a front-clip harness or Gentle Leader to make leash training easier and faster. Cat keeping you up? Felines are nocturnal by nature, so it’s important to give them a reason to be active during the day so they adapt to your schedule. Have regular playtime with your cat in the evening hours before bed, and you can also teach your cat not to bother you in bed by using a quick squirt of water from a spray bottle. With any behavior problem, it’s important to rule out a medical cause first. The vets at AMC of Tyler can help—make an appointment for your pet online or call us at 903-617-6891. Got a Friend With a Pet Who Needs a Vet? The entire team of professionals at Animal Medical Center of Tyler is dedicated to improving the quality of life and health of your pet. Our world-class staff combines cutting-edge veterinary technology with decades of experience to provide the highest level of care for your animal companions. © Copyright 2019 - Animal Medical Center of Tyler. Veterinary Marketing powered by iVET360.